There were two of the Mimaluse (death islands) near the town where I was staying, and in consequence I paid a visit to one of these, choosing that which best showed the devastation that is overtaking them all. The ruin has not been wrought by the settlers, but the tourists seem unable to visit these places, sacred to the red man, without carrying off some souvenir of the trip, and they are sure to walk away with skulls and bones, or sometimes a whole skeleton if a particularly perfect one is seen. But no such unhallowed desires filled the hearts of our party as we put off from the shore one beautiful March morning. An Indian guide stood sponsor to the guard upon the island for our good behavior—for the red man has taken this method of pro­tecting the bones of his forefathers, after having appealed to the best instincts of his white brethren, which did no good, and to his government, which did but little more. The burial islands are well patrolled in the daytime, but the Indian has too wholesome a fear of the spirit world to allow himself to stay in such a city of the dead after nightfall - when, of course, vigilance is most needed. We could see, on approaching the island, a very modern-looking tombstone, but that had nothing to do with the Indians. It marks the grave of a white man whose whim it was to he buried there. The island is small and could be thoroughly explored in a couple of hours. It is of lava formation, the rock being plentifully covered with fine white sand, and on the high ground, where the death huts are, the coarse grass grows high and thick. The little shanties for storing the bodies are of rough, unpainted boards, and so near the color of the sagebrush as to be quite unnoticed from the river. Before being brought to Mimaluse the dead are tightly wound with many band­ages, but whether the material be fine muslin or a gaudy patchwork quilt, it is done with loving care, and to this is due in large part the excellent preservation of the bodies. An outside wrapping of rope completes the burial costume. The face has a mere cloth covering, which in time becomes a veritable mask. I looked through a large crack in one of the boxes in which a number of bodies were stored, directly upon the face of the topmost one, and could scarcely believe it embalm them; there is no secret process, as some have thought. The balmy breezes from the ocean perform the work thoroughly and well. This disposition of the dead was orderly and respectful until the white man came. The redskins, with simple rites, laid the forms of their loved ones in their resting-places in the boxes within the death huts of the Mimaluse. By their side were placed the implements they used in life - pots, pans, spoons, etc., all strung together. Sometimes there were articles of value, quaint carvings and arrow-points, covered with a cloth, so perfect was the outline. 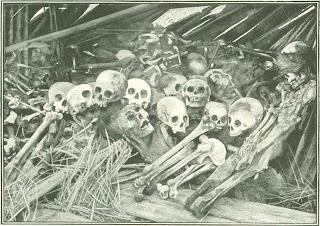 Some of the huts were in complete ruin—the boxes broken, and the place one mass of bodies, most of them pulled apart and the bones scattered about. I found a little hand, beautifully formed, some dis­tance from one of the houses, and farther on a foot that evidently belonged to the same body. Both were covered with skin which was as light and dry as parchment. The preservation of the bodies was remark­able, although the Indians do nothing to and it was the worth of these that started the desecration of the islands and turned them into gruesome spots, revolting to one accustomed to well-kept cemeteries. A year or two after my visit the waters of the Columbia rose to an unusual height, and I afterward learned that the island I had explored had been entirely submerged, and that the receding flood had left little upon it: huts, bodies, bones, the cause of so much heartburning and contro­versy, had gone where they would never be disturbed. Originally published in Cosmopolitan Magazine, January 1899.
this should not be published, these images are a desecration of the dead, have some respect. Please respect the wishes of the tribes and remove these images and ideally the whole article in respect for the human rights of the Columbia River people. The tribes are now being notified and will be contacting you shortly. This article and use of this image is disrespectful, irreverent, exploitive and abusive. You need to remove it. How would you feel if someone published photos of your deceased grandparents on the internet for everyone to gawk at? These photos need to be removed. They are inappropriate and disrespectful to their descendents. This article, and especially the photos, need to be removed immediately. Exposing the remains of innocent people is an invasion of their privacy and distressing to their descendants. get a life people..these are just the remains of what is left of a vessel in which our minds are carried. in other words, they are just bones.. nothing more, nothing less. anyone offended by this should join the bodies at the bottom of the river. You obviously know nothing about our people. Take this down! It is so disrespectful. And whoever "Anonymous" is, I'd hide my identity with such an ignorant comment like that too! You better pray no one does this to you or your family. Its NOT ok. Not ok AT ALL! TAKE IT DOWN! This an article from 1899..these are drawings with lots of artist licence..this could havecone from the artists imagination. What you are doing here is posting pictures and descriptions in an article about someone’s deceased relatives for entertainment and profit regardless of when it was written. 1899 was really not that long ago and the term Redskins is still used today, racist, and just as offensive. There is the really no difference from that time period when Settlers sold Tribal members bones or had their skin made into lampshades or bound books with the skins of Tribal members.....all for profit. You are still using the deceased for entertainment and profit. You ask for a donation following the article. This is disrespectful and offensive. Everybody is a damn crybaby these days. 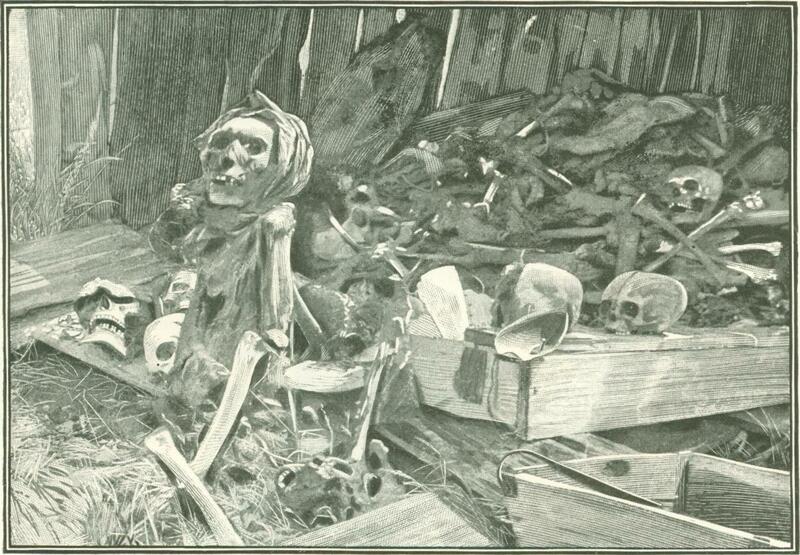 The article is 120 years old...the "pictures" are just drawings. There's not even any proof that this story is real. Though even if it is real, it's history - you can't change it & you can't erase it. So grow up and get over it because honestly, nobody cares about your hurt feelings. Go find something else to cry about. Let me know where your family burials are so I can go dig them up and take a whizz on them then. This article should not be online with the images it has. This article is a desecration of the dead, a desecration of the human rights of native peoples of the Columbia, and something that no anthropologist working today would do ever again. 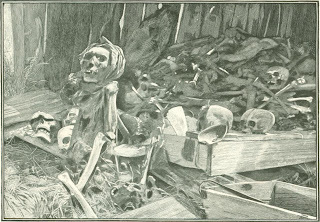 We all know the sordid history of how Native burials were treated, by being collected and stored in museums, but there were numerous human interest stories also published with images of the dead, previous to the theft of all these human remains to museums. Please remove this content out of respect for the wishes of the tribal people. The tribes in this region should have been consulted about the post and the pictures before it was published. If not out of historical professionalism, then out of basic human decency. This should probably be removed and an apology would not be amiss. Shame on you for not respecting those both dead and living whose culture you further desecrate with this piece. Please remove these drawings and racist commentary.